EMPLOYEE TOWN HALL MEETINGS – 3 Easy Ways to Spice Them Up! Could you imagine a day when your employee town hall meetings are all the rage? Could you imagine there being so much buzz that you actually feel excitement in the air? Is this even possible? It could be for those who are willing to rethink and reinvent their town hall meeting formats. Today, leaders are paying much more attention to creating town hall meetings that are captivating and motivating. Why this renewed focus? It has to do with multiple high-profile studies that show employee engagement ushers in a host of profitable benefits: higher employee morale, increased trust, a healthier bottom line and more. McKinsey & Company says organizations that motivate employees are 60% more likely to be in the top quartile for overall business health. Gallup says companies with highly engaged workforces outperform peers by 147%. What is the key to waking up disengaged employees and moving them to the engaged column? A whopping 70% of people they are much more engaged when senior leaders communicate with them directly about company strategy! This means that your old boring town hall meetings can be transformed into one of your most powerful engagement and communication tools! There is nothing more effective than a robust and engaging town hall meeting! Likewise, there is also nothing worse than a predictable, boring town hall meeting! Just as you are now competing with expectations set by Amazon on the customer experience, you are also competing with expectations set by high-end webcasts and other media. This is why it is important to reinvent your town hall meetings, so they are “must attend” events for your people. Otherwise, employees will check out. A compelling town hall meeting is like a good movie. When it’s well produced, it’s memorable. It leaves people emotionally connected and motivated. 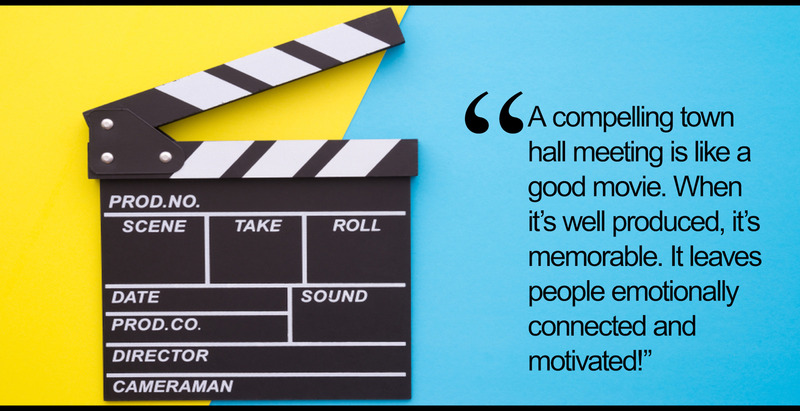 So, put on your movie producer hat and consider how can you help your team spice up your next town hall meeting. Then, sit back and enjoy the fruits of this special event. 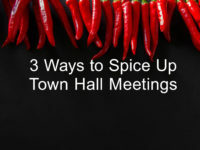 There are three “spices” that will perk up your people and make your next town hall as popular as a pair of tickets to Hamilton. Well, perhaps that is a stretch, but it will give your meeting a little extra kick! SPICE # 1 – STIMULATE THE 5 SENSES! Movie producers bring in a team of writers, directors, staging experts, voice coaches, costume designers, lighting specialists and others to create compelling stories that stimulate the senses. As you begin planning your next town hall meeting, ask yourself what story are you trying to tell this quarter? What is your storyline? Who are your main characters? How can you use staging to fully associate your employees into your organization’s story and stimulate their senses? If you fail to do this, you can end up with a dissociated and bored audience – a haphazard event with mixed outcomes much like a box office bust. As sensory human beings people are greatly influenced by environmental factors that activate their five senses. So ask yourself how can you stimulate your employees’ senses, so they leave the meeting more focused on achieving organizational goals and fulfilling their purpose? Smell! How many people think about smell when they plan a meeting? Not enough, yet smell is the strongest of the five senses because it is most closely linked to memory. This is because olfactory bulbs are part of your limbic system and they are directly connected to the parts of your brain responsible for emotions and learning. Thus, smell has the power to trigger memories and motivate your thinking. If you have ever attended an open house, you know realtors often use vanilla scents or chocolate chip cookies to make a new home smell warm and inviting. But, according to a report in the Journal of Retailing realtors might want to switch to the simple smell of orange. The study found that shoppers spent 31.8 percent more money when stores used simple orange scent. Another study on orange scent says it increases alertness and reduces stress levels. Think about your town hall meeting goals as you consider smells: are you wanting to motivate people to buy into new initiatives and goals? Are you wanting them to simply chill out and connect with your leaders at an emotional level? There are many smell options to match your meeting goals. Peppermint is known as an energy booster and increases alertness for brainstorming sessions. The smell of cinnamon improves focus, while lavender is known for its calming properties. Essential oil diffusers are inexpensive, so as you prepare for your next town hall meeting, grab a couple of bottles of essential oils like those made by Young Living or doTERRA. Sight! Great visuals should be standard fare for an engaging town hall meeting. In a world of shrinking attention spans, visuals play a crucial role in motivating and informing your people! About 95% of organizations worldwide use PowerPoint for their meetings, and a well-produced PowerPoint can boost and stimulate the senses. Yet, most organizations continue to abuse this powerful tool! Our team was asked to create a PowerPoint presentation for a worldwide consulting group that was rolling out new research to CEOs gathered in China. The research data was the central character, but that didn’t mean the slides had to be a boring data dump. Comments about the finished product included “visually compelling” and “a visual masterpiece!” So, instead of kicking PowerPoint to the curb – tap its true visual power to engage the important sense of sight. Of course, always include videos and other multi-media to tell your stories and keep your employees fully engaged during meetings. Lighting is another overlooked but critical “sight” element for town hall meetings. 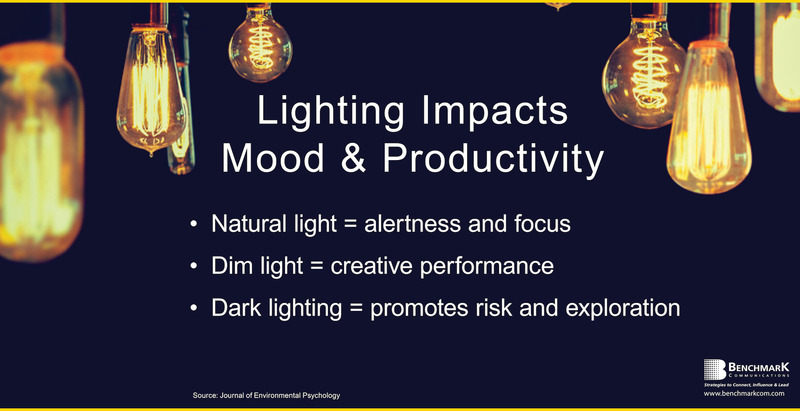 Multiple studies reveal intriguing insights into how lighting impacts your mood and productivity. Lighting conditions affect your hormonal secretions and the sharpness of your mind. For example, if your meeting goal is alertness and focus, a study in Behavioral Neuroscience recommends you choose room or area with lots of direct daylight. If your goal is to encourage creative performance, dim lighting is recommended. But if you want to trigger a more risky, explorative style in your people, dark lighting elicits a feeling of being free from constraints. Think music concerts! Sound! Consider all the ways you can incorporate sound to spice up your meetings! The possibilities are endless. We worked with a pipeline group to improve their town hall meeting engagement levels. The president’s presentation title was, “Got Pipes, Got Plans, Got Profits”, and as he took the stage, the audience heard the roaring sounds of Harley motorcycle pipes. Employees were wide awake and knew this was NOT the usual boring meeting they had come to expect! Music is another sound element that impacts mood and attitude. Studies reveal that 90% of the time people have positive experiences when listening to music. Remember that everything you do communicates something, so choose music that matches your town hall meeting goals. Identify appropriate music your people will hear as they enter the meeting room, during breaks and when they leave the meeting. Do you want to use music that creates a relaxing environment, or is your goal to create an energized and motivating environment – or a little bit of both at different points in the meeting? You may also consider a “theme song” for your organization much like political campaigns now use. Whatever you decide, of course, always check the usage laws. Taste! Food and mood go together! You may know “hangry” has been added to the dictionary and refers to hunger causing you to become angry or frustrated. So, the time of day and food should be carefully considered as you plan for your next town hall meeting. Energy levels and mood are greatly impacted by the kinds of foods and drinks you consume. Proteins, whole grains and other foods impact alertness and attention during meetings. Also, a study published in the British Journal of Health Psychology says there is a strong correlation between eating fruits and veggies and feeling more positive. There is no doubt that food greatly impacts the productivity of your town hall meetings. The president of a Fortune 500 group was concerned his company was boring employees during town hall meetings, so he scheduled a tune-up session with our team. He was very open to changing his presenting style and mixing up meeting formats to keep employees engaged and motivated. It says a lot about an organization when leaders proactively take the initiative to create meaningful town hall meetings. Formats are essential to a successful meeting. Think of them as your overall storyline. If your format or storyline is the same every time – chances are employees are tuning out. There are so many things you can do to keep your formats fresh, and here are just a few considerations to ponder. Avoid reusing the same meeting format! Keep things fresh and compelling. Vary the meeting size – some for large groups and some for smaller groups. Vary formats to include a mix of one and two-way communication. Sometimes, include meals and other times just snacks. Identify fresh ways to recognize excellence and accomplishments. Vary the locations. Consider outside venues during nice weather. Invite a special surprise guest to address the group. Keep things simple – no more than 3 topics. Use real-time, electronic polling to solicit employee input on key topics. The possibilities and options are absolutely endless! You can expect some major payoffs when you in invest in well-designed town hall meetings. At the top of the list is increased transparency and trust levels! 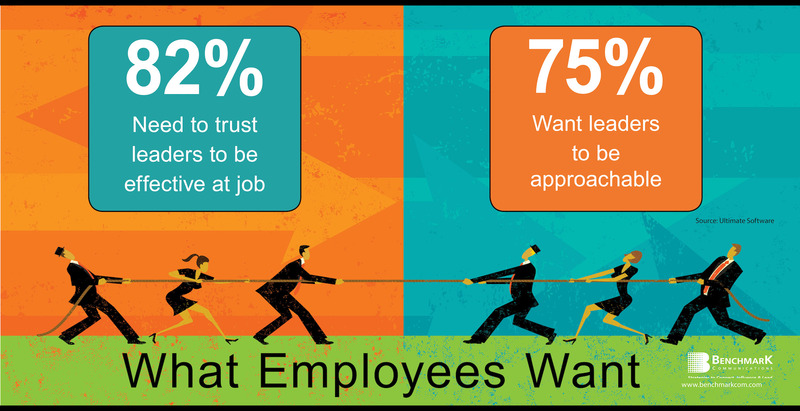 Studies show employees prefer to work for leaders they trust and view as approachable. We helped a Fortune 500 group embrace storytelling as part of their baseline leadership skills with a goal of improving employee trust and transparency during meetings. When the president shared a personal story at the next town hall meeting, he was surprised at how it quickly changed his employee relationships. They no longer went out of their way to avoid him in the hallway or elevator. Rather, they felt free to approach him and talk about company strategies! Effective storytelling releases feel-good chemicals like oxytocin that makes people feel more connected and empathetic. It is easy to see why stories are a crucial spice for successful town hall meetings. Effective communication by leaders improves trust and employee engagement levels. Some leaders feel vulnerable during town hall meetings when employees with open mics can put them on the spot with tough questions. It is natural for organizations to try to protect their leaders from embarrassing moments. Some resort to asking employees to submit questions ahead of time or via an electronic polling system. But, this can be off-putting to employees who may perceive the move as quashing employee voices. So, it is preferable for leaders to be authentic and prepare for the tough questions. This will not always be easy, as American Airlines CEO Doug Parker recently learned. During a meeting with airline mechanics, one employee told Parker how they had made sacrifices to help the company prosper over the years. Then, the employee asked Parker, “What have you guys sacrificed?” Parker stumbled around and finally admitted he had a good life and hadn’t made many sacrifices. There were so many better answers, but Parker was clearly blind-sided. The lesson is that leaders need to be fully prepared for a wide range of town hall meeting Q&A. Although Parker stumbled, at least he was in the ring and participating! Keep in mind that a compelling town hall meeting is like a good movie. When it is well produced, it is memorable. It leaves people emotionally connected and motivated. Take time to create an environment that engages people at a sensory level, keep your formats fresh and embrace transparency. Anything worthwhile requires an investment of time, planning and creativity. Good things come to organizations who pursue employee engagement. Motivated employees are the spice that turns a good organization into a great organization! HELLO & THANKS! We hope you found this information helpful! Our team helps leaders and organizations transform their potential with better communication strategies and skills to tell their stories and motivate their people to achieve stronger business results. If you need help transforming your town hall meetings or want to improve other strategies, give us a call or send us a quick note. We provide consulting, coaching and training services in: leadership development, communication / soft skills, reputation management, stakeholder engagement and storytelling / presentations. Benchmark has consulted with and trained leaders and associates from all 50 USA states and more than 25 countries.